Great Falls Basin is just north of Pioneer Point. Many people visit the falls below the basin. The upper basin can be accessed from the bottom using a trail which starts near the falls or from the top via Crow Canyon (which is most often reached via Homewood Canyon). This section also covers Indian Joe Canyon and the slopes of Argus Peak, including an area to the southeast of the peak I like to call Argus Rocks. 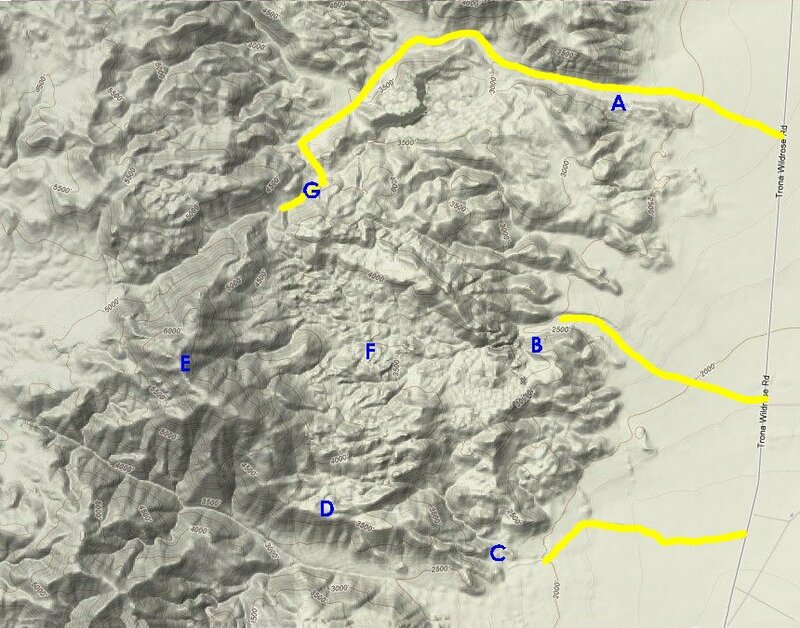 The three main vehicular routes into this area are shown in yellow on the map. The roads leading to Indian Joe Canyon and Great Falls Basin are dirt and the road up Homewood Canyon is paved until the Ruth Mine at which point it becomes a dirt road. Indian Joe Canyon is located just north of Wilson Canyon and Pioneer Point. At one time it was privately owned, but in the 1990's it was sold to a nature conservatory. Several decades ago fruits and vegetables were grown in the canyon for sale in the Searles Valley area. There are two main springs where produce was grown. One is called the Lower Garden and the other is called the Upper Garden. Water still flows from a pipe at the Upper Garden. The two gardens are located about a mile or so apart in separate branches of the canyon. There are fig trees which still produce fruit at the Lower Garden. The area that I refer to as Argus Rocks is found on a small basin half way between Christmas Tree Springs in Wilson Canyon and Argus Peak. It is most easily reached from the mouth of Indian Joe Canyon. Either walk up the ridge from this point or continue up the canyon beyond the Lower Garden to reach this area. Alternately, one can just walk up the first canyon to the south of Indian Joe Canyon or straight up from Christmas Tree Springs. I have done it each of these ways and the ridge between Indian Joe Canyon and the first canyon to the south is probably the best route to take.